PENNSYLVANIA -- Janet Jones of the 2100 block of Overbrook Road was ordered by Montgomery County Senior Judge Albert R. Subers to pay $45,600 in restitution to the Montgomery County SPCA to cover the cost of room and board and veterinary care for the 96 cats and nine dogs that were seized by the SPCA from Jones' home on Sept. 13, 2002. "There is no doubt in my mind the defendant is guilty as charged," Judge Subers said at the conclusion of a trial that was mandated when Jones appealed her Dec. 17 conviction of summary animal-cruelty charges by District Justice Harry Nesbitt III. Subers said the animals will not be returned to Jones, who has 30 days to file an appeal of the verdict. Jones, 53, and her lawyer, Kevin Sommar, refused to comment on the ruling as they left the courtroom. "Owning an animal in society is a privilege. Janet Jones abused that privilege," said Assistant District Attorney Samantha Cauffman, who argued the cruelty occurred when Jones denied the animals access to sanitary shelter. Officers of the SPCA testified they encountered an overwhelming odor of urine inside the home and said walls were stained with urine. Feces coated other surfaces of the house, prosecutors alleged. Some of the animals were emaciated and had respiratory infections, according to testimony. Dead animals were discovered stored in plastic bags in Jones' freezer and refrigerator. "The bodies in the freezer, right above where she has food, that does go to sanitariness," said Cauffman, who pleaded with the judge not to return the animals to Jones. "They deserve a better existence than what she gave them." The carcass of another animal was discovered under an entertainment center, testimony revealed. Cauffman argued Jones' residence is an example of why state legislators drafted animal-cruelty laws. "If there was ever a case that the Legislature had in mind when creating the unsanitary-shelter portion of the statute, this is the case. Janet Jones' residence is what they were talking about," Cauffman said. Sommar argued the animals were well cared for by Jones. He claimed investigators never tested substances allegedly found in the home to verify their conclusion that it was urine and feces. "Merely because the odor may be overpowering to humans does not make the conditions unsanitary," Sommar argued to the judge. "They leaped to conclusions that any dirt they saw was feces and urine." When Jones testified, she claimed "not a drop" of urine and feces was found on the floor of her home when the SPCA showed up on Sept. 13, 2002. Jones testified she acquired the animals in many ways, sometimes inheriting them from friends who died. People also abandoned cats suffering from feline leukemia, leaving them on her property and she took them in, Jones said. "I provided shelter and housing because there is no alternative for animals like that," said Jones. "Every story how I got them is different. Each one has its own little story." Sommar asked Jones how she could tell the animals apart. "I don't have roll call every day," Jones said. "You know who's who. They all had names and nicknames. You just get to know, they're like members of your family." Jones testified she took very good care of her animals, giving them fresh water daily, fresh bedding, fresh food and veterinary care and had them spayed or neutered. There were heat lamps, heated water dishes and umbrellas in the "cat yard" to protect the animals from bad weather. Jones told the judge she had special areas set aside for cats suffering from feline leukemia and a cabinet full of intravenous fluids and medicines. "I had a stash of every kind of antibiotic there is. I was ready and prepared for whatever," Jones told the judge. As for the dead animals in her freezer, Jones testified she kept them there until she could take them to a veterinarian to have them cremated. "If you let them sit around they don't smell very well," said Jones, explaining why she put the carcasses in the freezer. David B. Beeghley, the lawyer for the SPCA, said that, under the judge's order, the SPCA must continue to care for the animals until the appeal process is completed. Officials said the 105 animals have received $6,000 in veterinary care since being seized last year. About 15 of the animals, some of which had feline leukemia and feline AIDS when they were seized, have since died, officials said. "The concern from the very beginning was the animals and only the animals. I'm never pleased to see a situation where a person allows this kind of situation to come up," Beeghley said. NEW JERSEY -- (Press release) The Department of Environmental Protection (DEP) with assistance from the Wild Animal Orphanage (WAO) and the International Fund for Animal Welfare (IFAW) today began moving 24 neglected and unpermitted tigers from a private facility in Jackson Township to a non-profit animal sanctuary in Texas. "We are moving these tigers today to end a saga of lawbreaking cruelty to these animals," DEP Commissioner Bradley M. Campbell said. 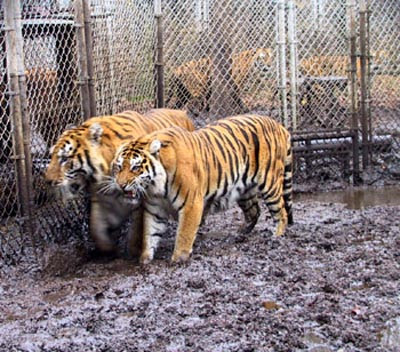 "Joan Byron-Marasek and her husband, Jan Marasek, not only kept these 24 tigers as pets, but they kept them in squalor." During an inspection just last week, the DEP's Division of Fish and Wildlife found the cats forced to choose between pacing knee-deep through a mixture of mud and feces, or taking shelter in their filthy trailers. Some tigers lived in such cramped spaces, they barely had enough room to turn around or stand. The ground on which these majestic creatures were forced to recline was perpetually wet during the winter months. 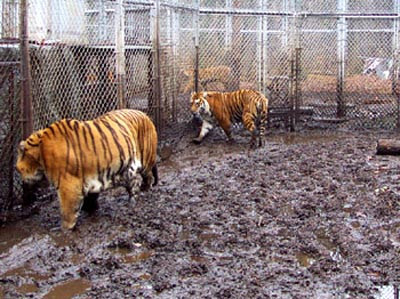 The Maraseks continually failed to refrigerate the tigers' food, and routinely fed them rotting deer carcasses, black with flies, and other spoiled meat. The Maraseks ignored the pleas of animal-welfare groups and a state Superior Court order to keep the tigers segregated by gender so they wouldn't breed and bring even more tigers into these abysmal conditions. In March 2001, the DEP documented a male and female tiger purposely caged together and mating. The deplorable, cramped conditions here resulted in multiple court rulings that culminate today with the tigers' removal to the WAO. The tigers will live at the group's new facility located on a 102-acre tract outside San Antonio, Texas. The WAO is a 20-year-old non-profit institution that is licensed by the USDA and regularly inspected. The DEP Division of Fish and Wildlife, in cooperation with the WAO, the Jackson Township Police Department and the International Fund for Animal Welfare, are taking every precaution to ensure this move goes smoothly and safely for the tigers and the public. Each tiger is being loaded into an individual traveling cage that will be rolled into a large truck container and carried by one of four tractor-trailers to San Antonio. A rotating team of drivers accompanied by two veterinarians will drive the tigers nonstop through the night. The trip to San Antonio will take fewer than 30 hours. "Today, as when the prior administration first began this investigation nearly five years ago, our goal remains the same: to provide for the safety of the Jackson community and to provide the tigers with clean, humane living conditions befitting these majestic animals," Campbell said. 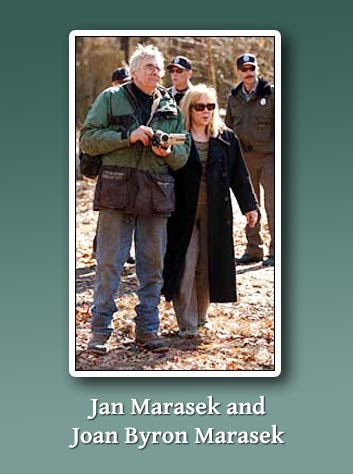 The DEP began investigating the Maraseks' Tigers Only Preservation Society on Monmouth Road in January 1999, after law enforcement officials shot and killed a 431-pound Bengal tiger found loose and roaming about Freehold Township. A DNA analysis of a tiger hair found on a briar inside the Maraseks' perimeter fence but outside the tiger compound matched the DNA of the roaming tiger. Superior Court Judge Eugene D. Serpentelli established on May 7, 2003, that the DEP and the WAO can take ownership of the tigers and move them Texas. 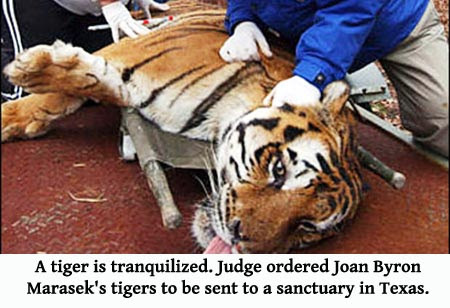 The Maraseks forfeited their ownership by failing to either obtain the proper exotic animal permits or to voluntarily move the tigers out of New Jersey. The DEP thanks the WAO and the IFAW for their substantial time and financial support with today's move. The DEP also thanks the Humane Society of the United States and Princeton University, home of the Princeton Tigers, for their generous support. NEW JERSEY -- Nearly five years after a loose tiger wandering this Ocean County community triggered a crackdown on a privately run sanctuary for big cats, animal welfare workers began removing the 24 Bengal tigers Tuesday, preparing them for shipment to a Texas animal sanctuary. By 3 p.m., 18 tigers had been loaded onto trucks, including some that had to be sedated with tranquilizer darts. A convoy of four trucks was expected to leave the Tigers Only Preservation Society on Tuesday night, bound for the Wild Animal Orphanage in San Antonio , which authorities said is better equipped to care for them. The move ends a protracted struggle between the cats’ owner, Joan Byron-Marasek, who has become known as the “Tiger Lady,” and state wildlife officials, who say the animals were being kept in deplorable conditions and needed to be taken away. The strange saga began in January 1999, when a loose tiger wandering near Byron-Marasek’s property was shot and killed by authorities. 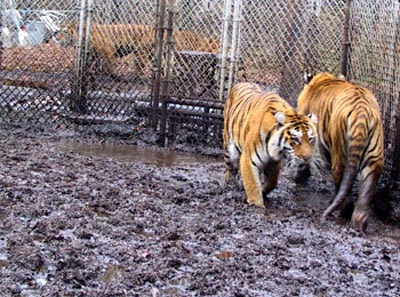 State officials never proved the tiger belonged to Byron-Marasek, but criticized conditions at her facility and denied the renewal of her permit to keep the tigers. Her appeals to overturn that decision were exhausted in November 2001, and a state Superior Court judge authorized a plan to move the animals. Byron-Marasek was at the compound when the workers arrived, but she left in a taxi around 7 a.m. , crouching down so photographers could not taker her picture. She was not immediately available for comment. McHugh said Byron-Marasek had obtained a hearing in U.S. District Court in Camden that was scheduled for Wednesday afternoon to try to seek some sort of post-event relief. Her most recent attorney, Darren Gelber, did not return a phone call seeking comment Tuesday. The tiger compound divided neighbors in this rapidly growing community of single-home subdivisions nestled among the scrub pines about halfway between New York and Philadelphia . Supporters said Byron-Marasek was being targeted by overzealous bureaucrats, while opponents dreamed of the day when there were no longer any tigers in the area. John Poulos carried a hand-made sign outside the compound that read “Let The Tigers Stay.” He blamed recent arrivals for Byron-Marasek’s troubles. Getting the big cats out of their cages proved tricky. In some instances, workers lured them into rolling portable cages with meat. Others had to be gently prodded. Still others refused to go, roaring and lashing out at workers. Five tigers had to be sedated with darts containing a mixture of Valium and ketamine, an animal tranquilizer. Asvestas said she was appalled at the physical condition of the tigers, who she said were soaked in urine and caked with mud and feces. One tiger had neurological problems that would not allow it to hold its head straight. Another was severely dehydrated and has sores on its feet. “I think it’s criminal for the government to give permits to facilities like these,” she said. Asvestas said her 102-acre facility is already home to 600 wild animals, including 42 other tigers, as well as monkeys, bears and other animals rescued from private ownership. It is registered with and routinely inspected by the United States Department of Agriculture. The convoy heading to San Antonio will be staffed by several relief drivers, two veterinarians and 10 animal caretakers. If all goes well, the tigers should be at their new home by Wednesday night, officials said. The move will cost nearly $300,000. New Jersey will provide $120,000, and the International Animal Welfare Fund, a group lobbying for an end to private ownership of big cats, is contributing another $120,000. It was not immediately clear who would pay the remaining $60,000. McHugh said the state plans to move in court to recoup its costs from the case from Byron-Marasek. SOUTH AFRICA -- Pit bull breeder Charles Murray, 48, who was mauled by four of his dogs last week, died in the intensive care unit of the Prince Mshiyeni Hospital in Umlazi at 3am on Saturday. Murray was mauled at his Margate home after a car on which he was working fell on top of him. When he began screaming for help, the dogs attacked him. Doctors and nurses were shocked when Murray was brought into the hospital. They had to amputate his left leg. Murray sustained injuries to his neck, stomach, arms, legs, a number of his ribs were broken and he suffered fractures to a number of other bones. According to Murray's son, Frank, the dogs had been relentless in their attack on his father. Murray jnr said his father had "pampered" his dogs and "taken special care of them". A neighbor, Rod Myburgh (who was also bitten), fought off the dogs with a pole and even when he managed to beat one hard, it continued with its attack. Murray's wife, Marie, shot one dog, hitting it in the shoulder. It stopped for a second and then continued to attack the helpless man. SAPS Dog Unit members arrived and shot two of the dogs and took the others to the SPCA, where they were put down. SOUTH AFRICA -- A South Coast pit bull terrier breeder who was mauled by his four dogs at the weekend, is fighting for his life in the intensive care unit at Prince Mshiyeni Hospital in Umlazi. Charles Murray, 48, sustained serious injuries to his neck, stomach, arms and legs as well as broken ribs and bones. His left leg had to be amputated. Murray was working on his car in the garden of his Margate home when the vehicle, which was suspended on supports, suddenly toppled and fell on to him. His three-year-old grandchild was playing in the car at the time. His son, Charles Murray jnr, who formerly bred pit bulls, said: "When the car fell on him he screamed for help and the dogs attacked him. "I'm not sure if maybe the baby let the emergency break down... I don't know." Neighbour Rod Myburgh rushed to rescue Murray after his 14-year-old daughter Bodene had alerted him to the attack. "My daughter was outside in the garden when she saw the car drop on him. The dogs went berserk... in a biting frenzy and were ripping him apart," he said. "I rushed out and grabbed a large wooden pole and went into the yard and tried to beat the dogs off him. I hit the first one hard enough to break his back and it just turned around and looked at me and carried on attacking him." Then the dogs turned on Myburgh, jumping on him and biting him. "I have punctures in my thigh muscle and one bit me in my neck when going for my jugular vein, which was visible when the doctor attended to me," Myburgh said. Murray's wife, Marie, arrived and pulled her husband's pistol out of his hip holster and shot one of the dogs in the shoulder. Myburgh said "the wounded dog backed off two steps" and then resumed attacking her husband. She fired two more shots, injuring a second dog when her son Frank arrived. The dogs then ran into the house. When Murray jnr arrived he opened the door, but quickly shut it again because the dogs "went for him" as if they were "mad in the head". Murray was taken to the hospital by his son Frank in a critical condition after an ambulance failed to arrive within the hour. The SAPS Dog Unit shot two dogs and the other two were taken to the SPCA where they were destroyed. SPCA anti-cruelty inspector Eric Taljaard said: "Pit bulls are naturally aggressive dogs. I have had a lot of complaints about his dogs and I have warned him. He still has two pit bulls on the property with six puppies," Taljaard said. Murray jnr said the family would stop breeding the dogs. "It's just too much of a fright. I stopped breeding because I haven't got a facility and my dad took the dogs. They are so loving - he would carry the dogs around when it rained. They are so pampered they don't know what it is like to eat dog's pellets because they ate meat, liver and pap," said Murray jnr.